Denim style has come a long way from the original button fly and riveted pockets of the 1800's dustbowl denim jeans. Crazy slanted zipper experiment as a fashion denim gender neutral statement. Classic button down wrangler pocketing. Degradation taken to extreme levels of focus onto the fly. Fringing and fraying are interesting style features on back yokes, waists. Together with fancy studding and side seam raw edging the look is distinctly western in flavour. Tied waists; external buttons at the fly; frills and fun embroidery detail at the fly all add fun detailing to classic blue denim jeans. Ragged fraying is not new to denim alone. Intentional fraying adds edge interest to raw natural muslins in this art installation by Bruce Chatwin. Plaid lined jeans call out for rolled cuffs giving emphasis to the hem. Likewise the pocket edges are rolled into plaid cottons. Further benefitting from a bit of degradation to give the impression of age. Broken seams, torn edges and ripped details are details that we love in our quest for a garment that looks aged and well loved. It helps if they are Japanese which have the added value of japan indigo romance. Original selvedge denims are the most sought after for being the original and iconic internal seaming worn to be seen as rolled cuffs. Red selvedge is today thought of as the original however, white selvedge is in fact the first and the most original denim edge woven on original shuttle looms way back when. Rough and ready hems and seams on original aged jeans and old look replicas. Seams on the original orange tab jeans to the left benefit from aggressive high low 3D finishing on all seams and exposed edges. Even when the bleach level is light the light dark contrast is marked. Heavy rust tint on an extremely old pair of confederate jeans highlights the white selvedge on the inside seam. Twin and triple needling on big rolled cuffs end naturally in a rough cut edge. Contrived giant shaped style denims created with twin and triple needle seams, finished with raw edgings. The most obvious areas for creative treatment are collars, cuffs and pockets. The bits around the edges that create attitude. Inside out denim which creates contrast additionally benefitting from degraded edges and the original "selvedge" denim. Degradation is enhanced by laundry coating to emulate the original wear of the garment. Focus is on white foamed and frayed edges and stone water textured indigo. Contrast fabric cuffs for a sport style edge to white denim. Rolled cuffs which reveal the backside of a super dark denim. Background image by Bruce Chatwin. From the book: Photography and Notebooks. French worker jacket (1930) from the book WORN (2015) by Douglas Gunn and Roy Lockett. Jackets from DIesel online store: D-CARPER and D-CAROL. White pigment coated fine weave when subjected to a heavy finish reveals the blue secret inside. Further enhanced by creative repair where wear should be. Contrast zippers, collars and seams give the style details more importance than the garment body. Pocket edge grinding plus faked cut out pockets to reveal the Diesel logo are cool edgings which match the frayed seaming and inside out frayed waistband edges. Such creative detailing work best with faked vintage denim creating and ironic vintage look. Iconic money pocket and jeans front pockets with aged vintage rivets and brace buttons are the real deal. Completed with worn in worn out vintage washing to reveal the heart of the aged denim. Denim fabric is visibly little changed. We spend a great deal of time playing with variants of what has been before, adding new fibres for touch, for stretch, for performance. Current changes are mainly performance related and invisible. The excitement is currently derived from creative effects in the garment. Denim garments are all about both detail and finish. The two are inextricably linked. Edges are frayed and unpicked; seams are degraded; edge stitching is obvious - blanket, braiding, beading. We consider what are the influences which give rise to new edge and fastening treatments. All images from Diesel online store besides: Fringe jacket: MSGM | Collar on the right side of the image: From the book WORN(2015) by Lockett and Gunn. | Image above collar from the book: My Archive 3 by Antonio Di Battista. We examine myriad variations of what's around the edges of a denim garment - collars, cuffs, pockets all which benefit from creative degrading; ripping and repairing; fraying and fringing. Contrast colour; white and blue spray; inside out denim, where the backside is as important as the face. The denim itself is a mere vehicle for creative edge work. Use of creative hardware and hard logos as befits the tough nature of the jean. Buckles used as decoration in weird places for effect only with a creative nod to its western origins. Lacing instead of zips or buttons. The constant throughout all the pocketing ideas is the angled western jacket pocket. Twin needled seaming which benefits from a heavy wash; flap pockets with button or snap fastenings. Closed pocket zippers are a more modern addition. The vintage reclaimed Japanese Kimono jacket which combines denim with original checks and stripes forces us to focus on the front edges the collar and the absent cuffs. The whole is enhanced by natural ageing creating a super romantic garment which would be much less alluring without the front edging. ARCHITEXTURE: Bold Big Ideas. Big Textures. Massive, bold, uncompromising scale of indigo patterns in technical finishes and stretch which distorts. Repeating motifs echo repeating shapes and lattice effects in contemporary architecture. Did basketry come first or did the creative textile come first. Whichever it is they both have a hand crafted yet hugely modern vibe. Straight and manipulated bentwood lines make both the lived in environment and influence on the worn indigo clothing chic and simply modern. Indigo geometry is enjoying a renaissance influenced by the harder stuff which surrounds us. Indigo prints and jacquards were much used and loved in South Asian and South American culture when their origins were from historical ornament. Again we use the same jacquard ornamentation but now influenced by a more contemporary environment. Tiles and patterns match in indigo. strict patterns work for clean cut indigo pieces. 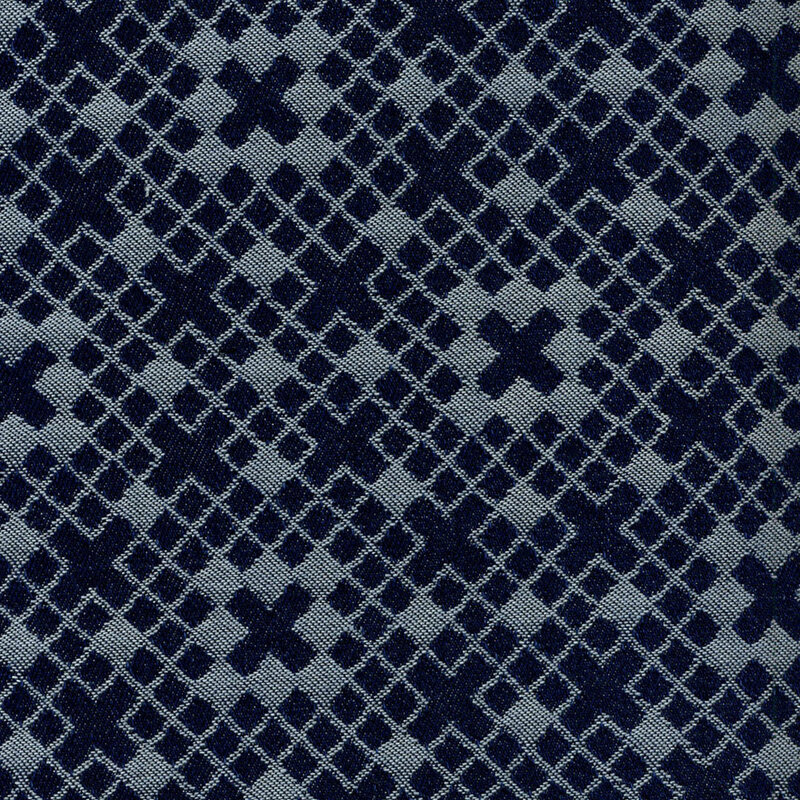 More complex jacquards in double faced and quilted cloths give the distinct impression of architectural origins. For structured simply cut jackets to showcase the pattern and fabric without interference of the stonewash effect. Varying scales and different weights in indigo patterns layered for intrigue. 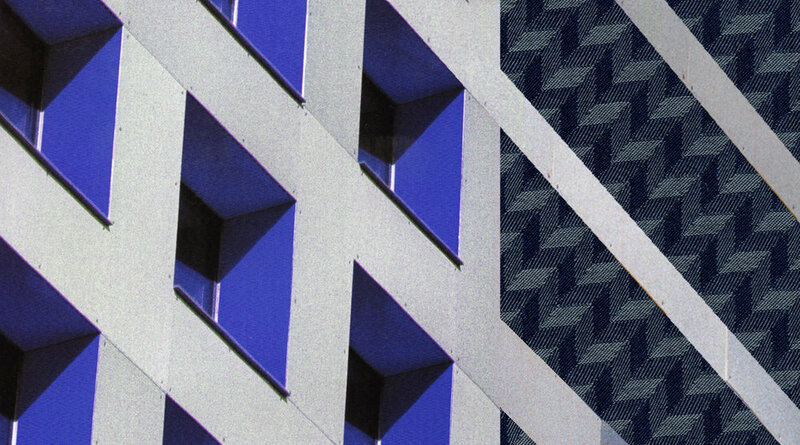 Technical fibres and fabrics combined with geometry have a strictness which emanates from architecture as an influence. Issy Miyake is one of the most inventive exponents of such layered geometric statements. This simple trend showcases bold statements in indigo "clothing" rather than just jeans. The purity of organic indigo sits in harmony alongside organic and brutalist creative architectural shapes, lines and spaces. Lines and cellular structures which divide spaces likewise divide indigo shapes and complex layers. The use of zippers is an important hardwear feature to echo shutters and building grids. 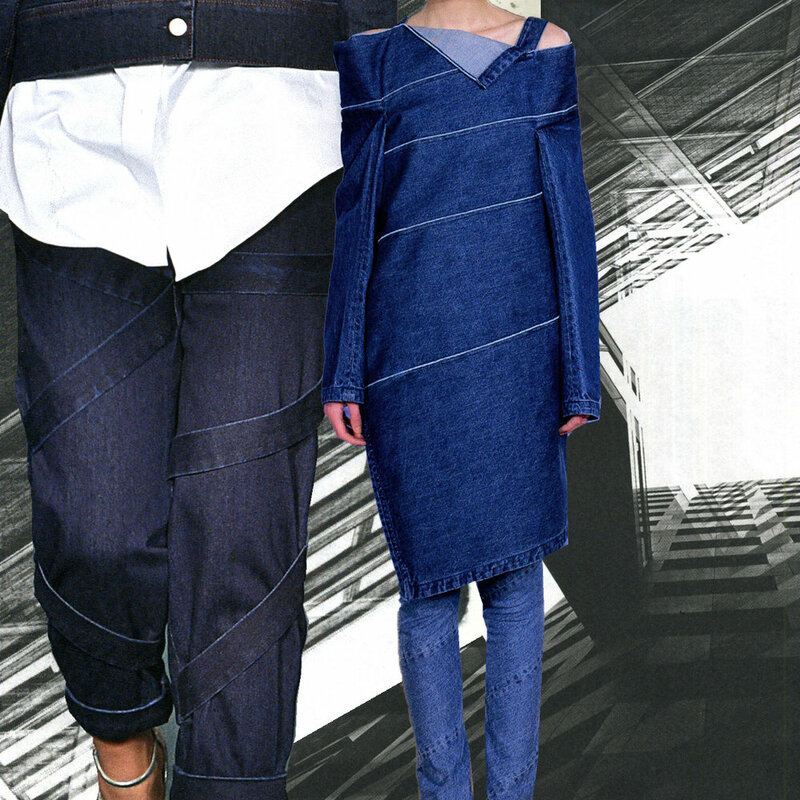 Contemporary structured cuts outs in denim clothing echo the same from the built environment. Geometric shapes in rigid denim which will be dry cleaned to retain its crispness. Stripes, lines, tucks and diagonal twists look new in indigo and strictly essential in our surroundings. 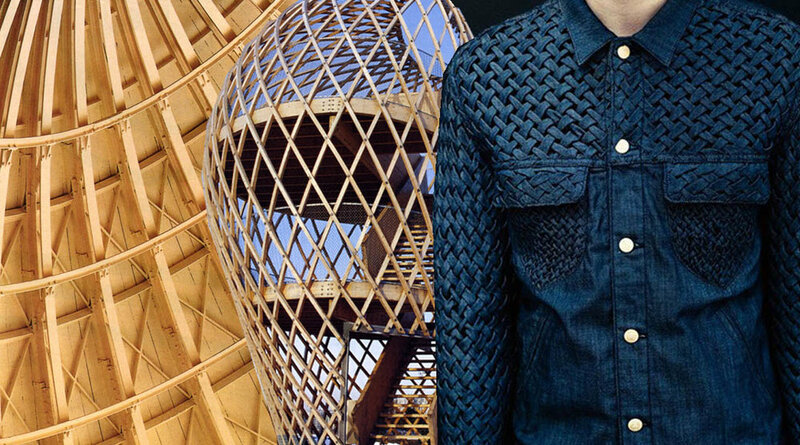 What's interesting about the link between architecture and denim clothing is the stiffness of denim fabric before cutting and washing and its ability to be tailored into strict shapes for a new wave of strict casual smart denim - a move on from casual chic jeanswear.